Redeem the Commute » Day 8 – How Does God Reveal Truth? We explore the idea that God reveals himself to us, rather than being something for us to find. Question: If God wanted to get through to your personality type, how would he communicate? Amazingly, God does want us to know him. That is incredible, because God is much bigger than we can ever completely know and describe, yet he wants to know us. Since God is the creator, and was around before us, God is not something out there for us to discover…or for us to make up. If that was God, and we could completely understand God as a result, then God would not be worth following, knowing, etc. because he is no different from us… just another part of this world. Instead, God is someone who chooses to reveal himself to us on his own terms. 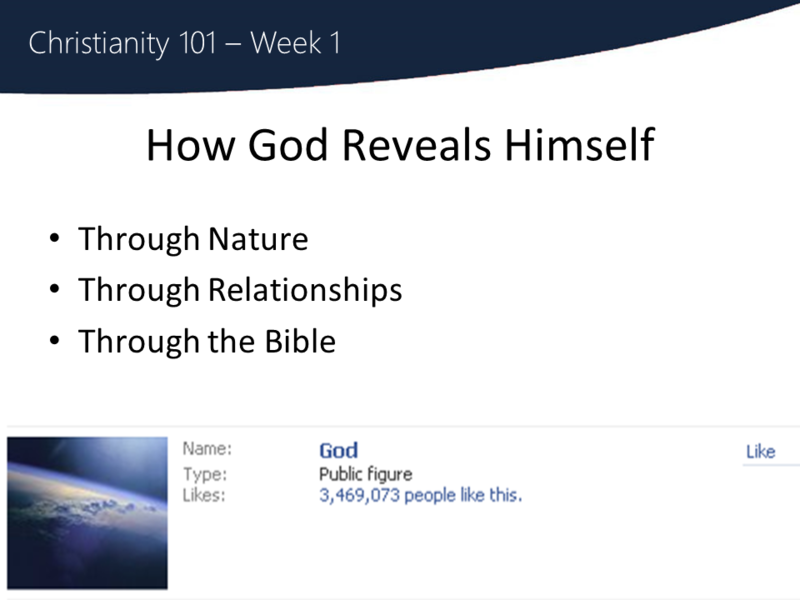 Like the privacy settings on Facebook, that give someone control over how much they reveal about themselves, to what kind of people, God has chosen to reveal some very public things to the world at large, and some more intimate details to his friends. We can see this public profile in the world around us, no matter what we believe – there is evidence of God. There is a lot of goodness in our world, generosity and charity, that we don’t see in the rest of the animal world, and isn’t the way things seem to naturally behave without outside influence. We can also see beauty in creation, beautiful people doing beautiful things. We can see fascinating advances in technology, science, medicine, etc. that all reflect the goodness, reason and beauty of God. The goodness in each other, despite our more primitive tendencies. But God also reveals more of himself, through relationships with his children. God specifically enters our world in sometimes dramatic ways. He shows himself in miracles, visions, speaks through prophetic messages. This can be God’s way of speaking in world, the Bible is filled with stories of God making himself known to people. He did this most completely, most powerfully, most decisively in Jesus. We’ll talk more about that in future weeks. But God has revealed himself in the world in a particular way through the Bible. Christians believe God is speaking through the words of the Bible. Among other things, the Bible describes those times in history that God has been revealed in creation and in relationships. If God wanted to get through to your personality type, how would he communicate?